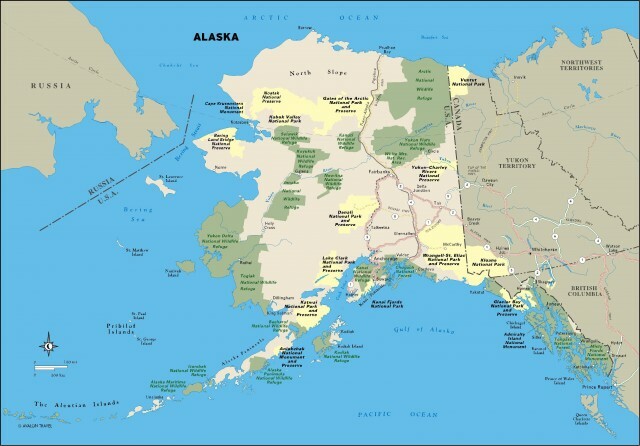 THE 49th STATE admitted to the union in U.S. history, Alaska is located northwest of the 48 contiguous states. It borders CANADA to the east, the PACIFIC OCEAN to the south, the Bering Sea to the west, and the ARCTIC OCEAN to the north. Alaska has several distinct physical regions. The southernmost region is named the Pacific Mountain System. The panhandle in the southeast mainly comprises the Alexander Archipalego, while south-central Alaska is made up of the Alaska Range, home to Mount MCKINLEY, or Denali, the highest point in North America at 20,320 ft (6,194 m). The coastal part of this region includes Prince William Sound and Cook Inlet. Lying southwest of the Alaska Range are the Alaska Peninsula and the ALEUTIAN ISLANDS. To the north of the Alaska Range, up to the Brooks Range, are low hill and valleys, or the Central Uplands and Lowlands. To the west are Alaska’s main river valleys (the state’s major river is the Yukon, flowing approximately 1,979 mi or 3,185 km) and to the north lies the state’s vast treeless tundra. America’s northern state has a rich and diverse past. Before becoming a Russian colony in the 18th century, the land was populated by some 70,000 natives, living in the the interior and southeast portion of the area. Here, the Tlingit and Haidi tracked caribou and fished. The Aleuts who inhabited the outer Alaska Peninsula hunted seals, sea lions, and whales. And the Yupik and Inupiaq Eskimos lived in harsher conditions while hunting for caribou, seal, walrus, and fish. In the 1740s, Russian fur-trading companies arrived on the Alaskan panhandle, and the way of life for the Aleuts was adversely affected. In 1778, the British explorer Captain James Cook visited the area, and a fur “rush” began. By the end of the century, British, Russians, and Americans were hunting in this newly formed Russian colony, governed by Aleksandr Baranov. The Russian colony, however, posed many problems for the Russian government. The distance from the Russian capital of St. Petersburg was difficult to overcome and food shortages were prevalent. The Russian settlements in northern CALIFORNIA were also failing as grain suppliers. In 1867, Russia sold its colony of Alaska to the United States for around two cents an acre. Many Americans questioned the deal and thus named the purchase “Seward’s Folly,” after William H. Seward, the U.S. secretary of state who negotiated the deal. For the remaining period of the 19th century, the Alaskan territory failed to attract farmers. However, many speculators became involved in the whaling industry, and the Gulf of Alaska turned into a haven for salmon fishing. Between 1878 and 1899, mainly because of Alaska, American canned salmon exports grew significantly. In 1896, gold was discovered in the Klondike River claim in Canada’s Yukon territory, near the border with Alaska. Gold prospectors soon traveled north and traveled through Alaska, and many prospected in Alaskan gold claims. Coastal towns such as Valdez and Juneau (the capital) were created. The gold rush lasted for over a decade, but by World War I, speculators began to dwindle across the territory. In the 1920s, Alaska’s white population primarily gathered along main transportation routes and in certain mining areas. The scene was virtually unchanged until the outbreak of World War II, which witnessed American military personnel being sent to bases in the area. By 1943, 124,000 military personnel inhabited Alaska, and fortifications were created in defense of the Japanese. The Alaska Highway was also finished during this period, which linked Alaska to Canadian railroads. The military remained in Alaska after the war, as part of the distance early-warning (DEW) radar stations to defend against possible Soviet missiles during the Cold War. In 1959, Alaska achieved statehood. In 1968, an arctic oil field was found at Prudhoe Bay, and three years later, the Alaska Native Claims Settlement Act was negotiated, which set up the creation of the trans-Alaska pipeline. The U.S. government gave 44 million acres (18 million hectares) and $962.5 million to the indigenous people. In return, the native Alaskans forfeited their rights to make aboriginal land claims. Thirteen regional and around 200 village corporations have thus invested in oil drilling and other Alaskan industries. All of the native Alaskans are individual shareholders in these companies. The pipeline from Prudhoe Bay to Valdez was constructed in the mid-1970s and resulted in incredible population increases to Fairbanks and Valdez. In the 2000s, oil money accounts for almost 80 percent of the state budget, and Alaska has become the United States’ largest oil-producing state. The money from the oil business has improved education, transportation, medical care, and communications. Overall, Alaska has the highest average household income in the country. However, the effects of oil production continues to be debated across the state, especially after the Exxon Valdez oil spill, which affected Prince William Sound in 1989. This catastrophic oil spill of 10 million gallons damaged the ecosystem throughout the polluted area. In the early 2000s, debate centered on whether oil drilling should be conducted in the Arctic National Wildlife Refuge in the remote northeast corner of Alaska.